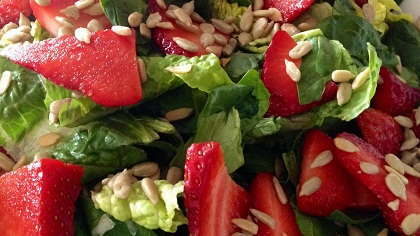 There is nothing like a refreshing salad to break out of a winter fog. Clean, tear, and toss lettuce and spinach in large serving bowl. In a blender, mix yogurt, strawberries, apple cider vinegar, poppy seeds, and Stevia powder to taste. Serve dressing on the side or toss salad with dressing and serve immediately.